The smell of freshly popped popcorn filled the hall. Excited kids ran to the front table stacked with brightly colored books and candy. The fun at Union Ridge Elementary’s Math and Literacy Night was underway. Students received a checklist of classrooms and activities. Each classroom had different math and literacy activities. Teachers initialed the checklist for a completed activity. When the checklist was completed, the student earned a book and a candy treat. With a range of age-appropriate activities for every classroom, there were plenty of new things to do. Fourth grade teacher, Rockwell Fransen, projected a picture of a glass jar filled with colored ornaments and asked the kids to count what they could see, then guess how many were in the jar. “Eleven!” “Seventeen!” “Twenty-one!” After he revealed the answer, he showed another picture—same jar, but more ornaments. The students counted what they could see, then estimated based on what they learned from the previous answer. “Twenty-four!” “Twenty-seven!” “Twenty-one!” “Cool, I was right this time!” Each new picture led to a frenzy of guesses and calculations. In other classes, students solved puzzles with geometric shapes and rolled dice to create math problems. They wrote acrostic poetry, choosing a word for each letter in SPRING, WINTER, or SEASON. There were paper bag puppets with the Pigeon character from Don’t Let the Pigeon Drive the Bus. And parents crouched down at tiny tables to help color bookmarks with markers and crayons. 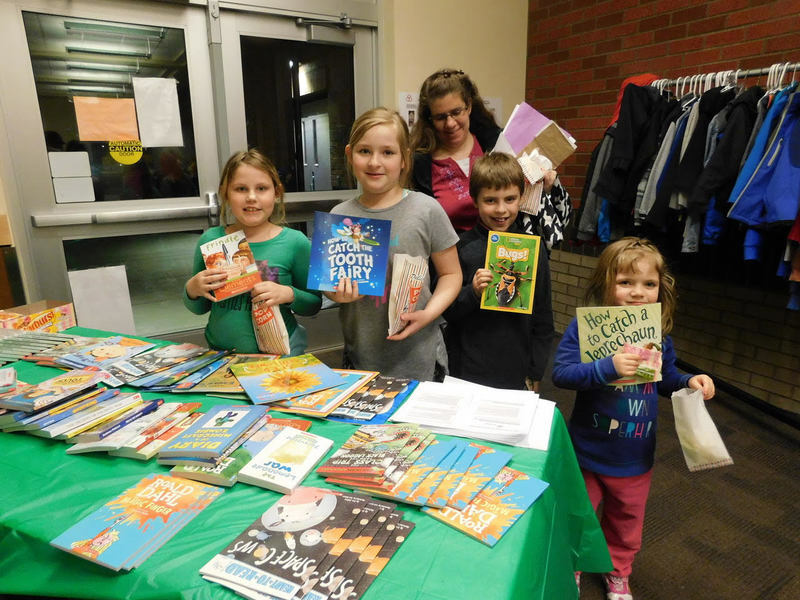 Math and Literacy night was a great family activity with lots of fun for everyone. Keep an eye on school calendars for future Math and Literacy Nights. Students picked out books after completing their checklists. Left to right: Lorelai Henry, Penny Henrichs, and Kimberly Schlemeier and family.